Makpromet is a Macedonian corporation involved in several industries. Our family of businesses includes the bakery Zito Leb, the confectionery products manufacturer Evropa, the printing company Illinden 2002, and the Makpromet Supermarkets. Indirectly the company owns the printing company Delpak, the steel construction company Makmonting, the seeds distributor and manufacturer Semenarstvo, and the industrial real estate of the former leather and textile manufacturers Godel and Makedonka. Our family of businesses integrate to take advantage of the convenient economic climate in the emerging market of Macedonia which has free trade agreements with the EU, Turkey, Ukraine, Switzerland, Norway, Iceland, Lichtenstein, Albania, Moldova, Serbia, Montenegro, Bosnia and Herzegovina and Kosovo. Our produce are available in both foreign and domestic markets, however we are more inclined to deliver our products to a wider range of consumers. Among our partners and stockholders we are known as a stable, growth company with long-term goals in every endeavor. Nevertheless, we are always open to new lines of business, so feel free to contact us. 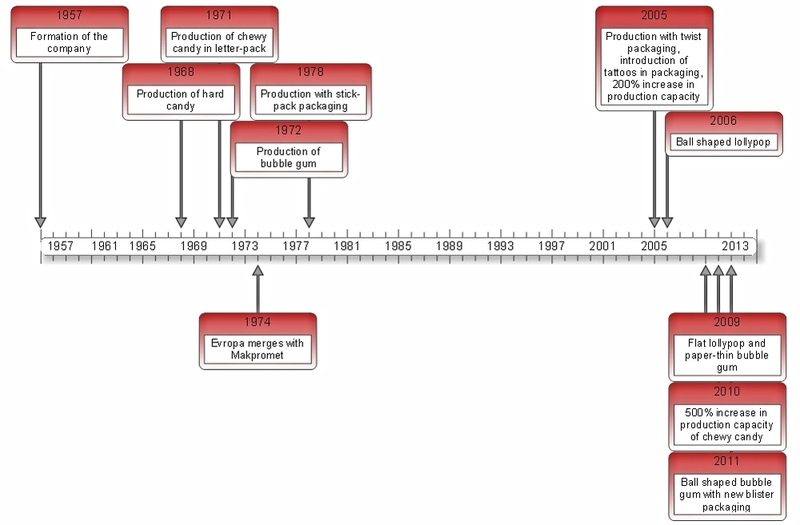 Back in 1957 several of the local candy producers in Stip, each using traditional, generations old recipes for their sweets, combined their knowledge to form a corporation they named Evropa (Europe) to symbolize the goal of the organization, to produce candy that would be available to satisfy a wide range of tastes in many countries with diverse cultures. Ever since the corporation has prospered, and our production capacity and range of products have continuously expanded to satisfy the tastes of the new generations. To achieve continuous growth we have invested all our energy in satisfying the tastes of our customers, and our reputation in the eyes of our business partners. These goals have been met because of our three step quality control system and our reliability in doing business. Our quality control ensures that the raw materials are of an exceptional quality, and that the intermediate and finished products are in compliance with our standards and the HACCP (Hazard Analysis and Critical Control Points) system. On the other hand, our internal standards demand that from the moment an order is made we need to ship our product in maximum 30 days. As a result we have received more than 30 awards for exceptional product quality, and our products are sold in 23 countries among which are the USA, Germany, Switzerland, Austria, Israel, Sweden, Denmark, Italy, Spain, Poland, Romania, Hungary, the Czech Republic, and every country in the Balkan Peninsula. 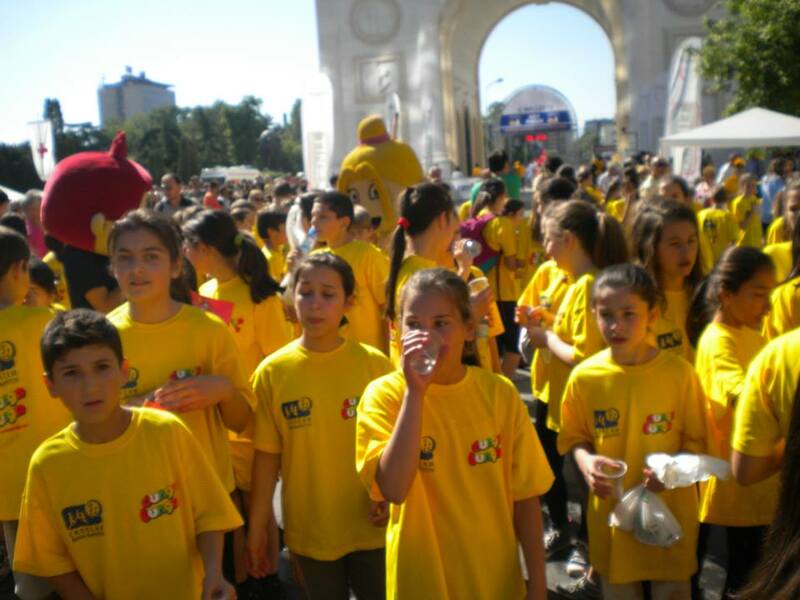 In a while all children from Slovenia to Macedonia knew the story of Cunga Lunga and enjoyed the taste of the chewing gums. Furthermore Cungo's friends, known as the chewers crew, were also established as part of the story that started developing subjects related to the typical problems for young teenagers, such as first love. To strengthen the spirit of the brand, we introduced the city where the chewing gums have always been produced, Stip, as Cunga Lunga city. In addition, one of Macedonia's best football players Daniel Georgievski became part of the Cunga Lunga story as a brand ambassador who proudly wears the colors of the brand. The story of Cunga Lunga starts out as a parallel of the development of comic books like Superman and Wonder Woman in the west. At a time when children's quest for inspiration and entertainment in comic books wasn't satisfied in Yugoslavia, the best illustrator of comic books and children characters in Slovenia at the time, Miki Muster, created a character called Cungo that would embody the dreams and hopes in every child. Cungo is a boy that lives to fulfill his dreams which are as diverse as his imagination. The endless stream of children who could recognize themselves in Cungo created an instant sensation among the young when the brand was created. Children started competing with each other to make bigger balloons or swap stickers outside their homes for the contest for collecting all Cunga Lunga stickers. Opened in Stip in 1957, using steam powered ovens Zito Leb created bread that quickly became a standard addition to the dining table in each home in Stip. To meet the growing demand, in 1976 our company started using automated tunnel ovens. Since then our production underwent several upgrades to reach the capacity of 3000 loafs of bread per hour we have today. 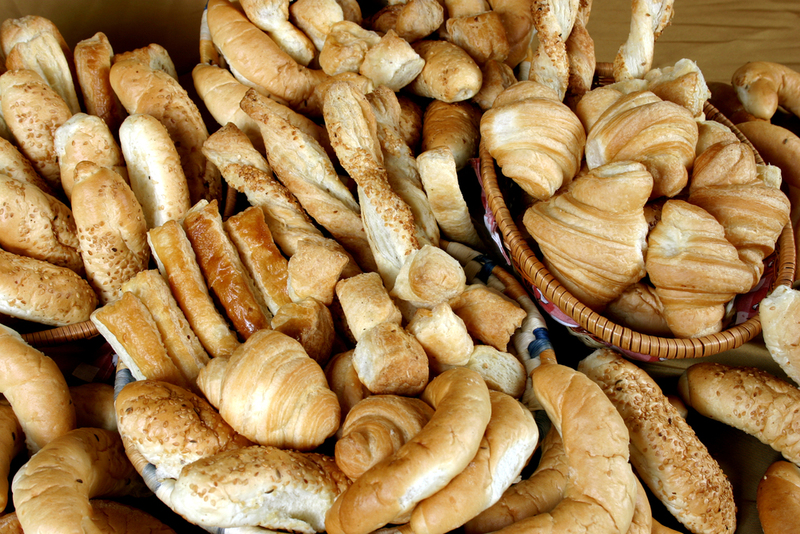 Through our well organized distribution network we supply fresh bread and pastry to more than 200 markets. The quality of our products and the ingredients we use are continuously tested in our laboratory. In addition, we regularly send samples to the Ministry of Health to conduct more extensive tests to ensure that our customers enjoy natural, fresh, healthy and great tasting baked goods. Our production and distribution are also in accordance with the HACCP system. A testimony to our quality is the fact that for more than 50 years over 65% of the local population has chosen Zito Leb, instead of other bakeries. Furthermore, part of our quality control system are the daily surveys we conduct to satisfy our customers' different tastes and preferences which have guided us in the introduction of new products and the upgrade of our technology. Our most recent products are the Cunga Lunga packaged croissants and frozen pastry. Since we are currently looking for partners to expand our presence on a global level with our croissants and frozen pastry, if you are interested in distributing our products or need a bakery to work for you under private label, please feel free to contact us. Also, if you are looking for a different recipe for your new private label product, contact us so that our experienced technicians can show you the additional options that we have for each shape and type of pastry. Investing in infrastructure to expand your operations is a serious endeavor we understand and care for as much as you do. Makmonting is your right choice for building your steel construction storage, manufacturing plant, or store. We have built enduring and attractive steel constructions, such as the Lukoil gas stations in Macedonia, that attract customers with their aesthetic value. Also, tubing/pipeline systems with gas pumps, tanks and any type of steel constructions are our specialty. Our team of educated and experienced constructors follow all european safety protocols and standards for constructing the infrastructure of your home or business. In addition we offer the cheapest price offered on the market! The factories Godel and Makedonka used to be huge leather and textile producers for Yugoslavia at the time. Today these industrial parks are meeting points of innovators and entrepreneurs who use the area to assemble and manufacture their products. Both industrial estates, Makedonka in Stip, and Godel in Skopje have administrative buildings, empty manufacturing plants and open real estate which can easily be modified to suit your needs. Godel has buildings with a total size of 29 000m², plus 40 000m² of real estate around the buildings. In addition, Godel has two electrical substations connected to the grid, with a total capacity of 5 MW and a private well with a capacity of 70 l/s. Makedonka has 70 000m² under a roof and 31 00m² of open real estate, it also has private electrical substations and wells with a total capacity of 18 MW and 60 l/s respectively. Also, both locations have boiler rooms that can produce heat of up to 50 MW for all kinds of purposes. In both Makedonka and Godel we sell and lease spaces, for more detailed information or for scheduling a visit please contact us. This 1350m2 manufacturing or storage space comes with a separate entrance for workers and a separate access for forklifts. This 4m wide, 2m tall door for forklift access includes a ramp, and can be further expanded. The height of the ceilings is not uniform, and ranges from 4.2m to 12m. This area includes 2 washing closets, a changing room, and an office. Most of the floor is covered with tiles, and all rooms have wide windows which allow for ample daylight. The area is suitable for any type of manufacturing, and suitable for placing large, heavy machinery. We offer 6 recently renovated offices for lease that are ready for you to move in tomorrow. These offices can be rented to several companies or a single company. With a total area of 380m2, this manufacturing space complies with HACCP standards, and includes a separate entrance for workers, for supplies, and a separate exit for finished goods. The layout also includes a storage space for raw materials and a storage space for finished products. This layout naturally offers a circular flow of goods. This building comes with 2 AC units, and an air supply network. Furthermore, the whole area can be regularly washed with water thanks to the wide network of drains, that allows for cleaning the whole space. The floors and walls are covered with high quality tiles, and the rooms have plenty of daylight. This area includes a 100m2 warehouse and a 200m2 work space that is perfectly suitable for light industry. It also inclides a toilet and a small office. This two-story building suitable for IT companies, for offices or light industrial activities has ample daylight, and installed lighting network. The 2 wide open rooms have a small kitchen, office and an area that can be used as a locker room. This 360m2 storage space has a wide 2.8m door that comes with a dock for access of heavy duty vehicles, and a separate entrance for employees. Currently the space includes a small office space, but can be adapted to the needs of your business. The warehouse has tile flooring.